The Bhut Jolokia, a former world record holder as hottest chili in the world (2007-2011), produces an average of 750,000 Scoville units. In India the chili has taken on various regional names, which all basically refer to the same variety with only minimal deviations: Naga or Bih Jolokia, Naga Morich, Raja Chili, Ghost Chili and many more. It origins from a natural hybridization of the species Capsicum chinense and Capsicum frutescens. 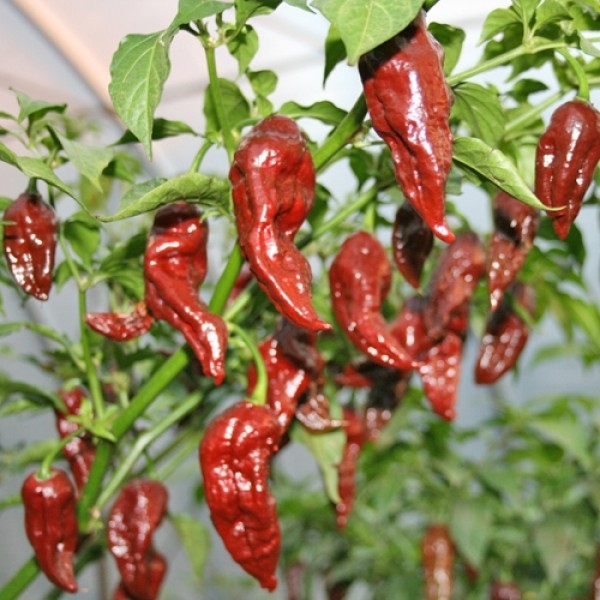 The Bhut Jolokia Chili produces shiny chocolate-coloured peppers, which have the typical fruity flavour of Bhut Jolokia chillies. However, the taste is slightly more bitter with a smoky citrus note. This flavour goes particularly well with hearty stews and soups, dark meat, and as an ingredient for grill marinades.